This pictures were taken during the prepares and shootings of the first completed movie, "I Love Her" in 1991-1992. Before that I've made many experimental movies, photographs and sculptures. Some characters were clumsy and to heavy to move on scene, or they melted on light. Nikola Majdak Jr. joined me in those experiments as cameraman. The Academy of Film and Drama in Belgrade gave us stop motion studio for those projects. We made a series of photographs and short films until we were ready for a real film. The main scene was four meters long and two meters wide. The armature was made of wires, as we were unable to provide something better. It took about six months to complete the film. 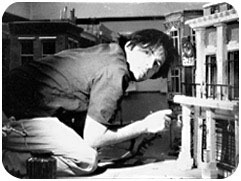 The buildings were made of Styrofoam and plaster, painted and airbrushed to complete a real life appearance, due to my architectural background. The film made a great success in public, even before it was finished, so we decided to make a group - "Swinging Pictures" and to continue to work. Next project, with no title, ended unluckily, and I started to work on feature films as assistant set designer. In the same time I started to work on computers in "ReVision Group". In 1993 Mr. Andonov employed me in his advertising agency "KompAni" where I still work. Most of the work is based on CG. 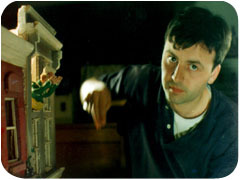 Since the process of animating clay characters is time consuming, clients opt for computers, where we employ Alias|Wavefront on SGI.stations.